This just creates more work for me. Now instead of sending you my blocked process reports and magically getting an answer, I have no excuse not to do the grunt work myself! Hahaha. I know Aaron, You’re pretty much exactly the audience I had in mind for this tool. You’ll get to practice reading blocked process reports. There’s a knack to it, but hopefully I can (eventually) make that easier too. Personally I use Alerts & WMI query mapped on a job which processes and sends a mail. I must admit this code allows a more abstract view of what happened. Good complementary solution for cold investiguation ! @Vincent Thanks! I hope people find it useful. Tell me how you got started with WMI (a course, or docs, or a blog somewhere?) and how useful do you find it? Michael, looks like good stuff and I’m in need of it. 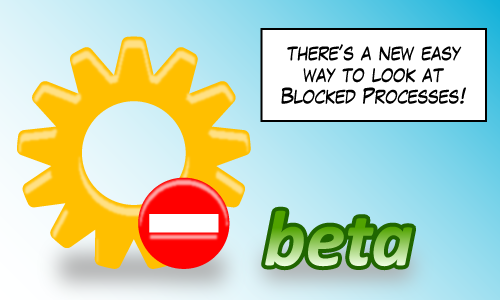 I have some blocking/blocked processes already identified. My problem is, I don’t really know what to do about it. I have a traffic control problem. Can you point me in a direction which will guide me to what I should be doing in my code to allow the big trucks to go thru and make make the Volkswagens yield? Awesome question Wallace, Have you tried putting Cow Catchers on all the big trucks? That should do it. You say try to capture a SQL trace that includes the “blocked process report” event. Since I never tried that before, what triggers it? My favorite blocking technique is to create a ## table, start a transaction, insert a row and in a different thread update the row just inserted. This event isn’t triggered as long as the command is blocked. –This selects everything on separate lines for the blocked and blocking spids. Thanks for the great feedback Ken! It’s much appreciated. You’re comments are on the money and I’ll incorporate them. It also reminds me that I should expand the documentation a little bit to include how to capture blocked process reports because these reports are disabled by default. http://msdn.microsoft.com/en-us/library/ms181150.aspx describes the config setting. You’re method of watching blocked process reports are useful when blocking is happening right now (similar to Who Is Active which is like sp_who on steroids). I’ll have to try it out. So if your method captures acute complaints my method monitors chronic complaints, stuff you can’t catch as it’s happening. “Chronic” and “acute” are the wrong words to use, but the best ones I could come up with to demonstrate the difference between the two. But thanks for stopping by Ken, I hope you’ll visit often. I use WMI on SQL Server for ages now so I could not really remember where I took the first inspiration (probably a book). I think few people are using it and it’s sad because it’s a gem ! I’m using it for Blocked process, deadlocks, and many live events related to critical errors. There is no hard thing in using it. Just need to implement an alert, map it to a job, build a stored procedure to parse the result of a WMI query and send the well construct HTML into a mail and we’re done. Great SP !! Thank you Michael! Glad to hear it Roman, Thanks for the feedback. Do we need to capture any specific events in trace? I’m continously getting File ‘blabla.trc’ either doesn’t exist or it is not a recognizable trace file. FYI my trace file is 450 MB in size and I’m able to open from profiler without any issues. I don’t think you are limiting anything by size! Also, i deployed the Stored Proc in our DBA Maintenance Database, not in the Master database. Could you pls. help me why i’m getting this error msg? I’ll try to address some things that maybe I didn’t make clear enough. If “c:\temp\blabla.trc” doesn’t exist, make sure the file name is correct. It’s the database server that’s reading the file, not management studio. So the file has to be accessible on the database server. Also, there may be a bug with mapped drives. Deploying the sproc to dba_maintenance database instead of master should be fine. Thank you for sharing the procedure. It helped a lot when I was analyzing a blocking problem on one of my servers. That’s so good to hear Adi. I’ve come to realize that feedback like yours is why I enjoy doing this stuff. I was redirected to here by Paul Randal when I was watching one of the chapter on waits in pluralsight. Initially I thought its just copy paste, but then understand it how to make it working. 1) This SP use the trace which you will saving as file or table. 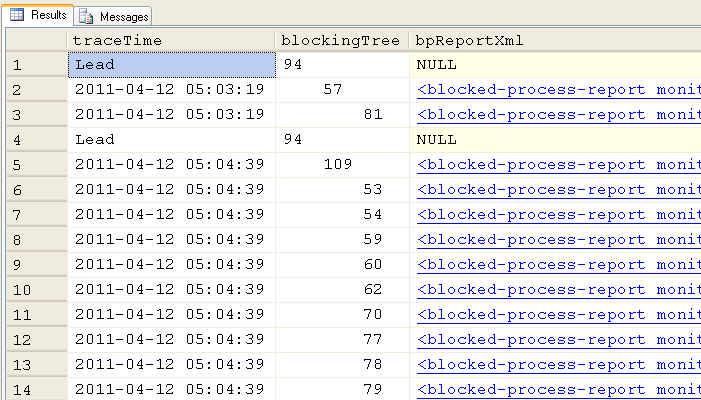 2) You need to run server side trace or profile to caputre only and only “Blocked Process Report” for your instance. 3) Before starting the trace or profiler, just ensure you mentioning where to save trace (file or table). And configure accordingly. 4) use sp_configure and change the default value of “blocked process threshold” to 10 (which is in second, by default its some 86400). With default configuration, you can understand how long you have to wait for first occurence of deadlock. 5) Now all the things in place and you can start your server side trace or profiler. 7) after 10 secs, the deadlock/locked information will start popping in file/table. You can stop the trace now or whenever you have enough data for deadlock/locked occurence. These steps are written considering you are trying to find the quick way for initial configuration required to test this tool. And you using non-prod box for testing purpose. Thanks Michael. I am in the process of creating this SP. Thanks to Ashish for giving details of steps to use this SP. It is really a time saver. This is great. I’m actually capturing the blocked process report using event notifications and writing the blocked process report to a table. I’m currently attempting to adapt some of your code to just directly read the out put of my table and shred the xml. I’d be happy to post the result here or send it to you when I am done. Yeah send it along, it sounds useful. When I wrote this tool, extended events (for blocked processes) weren’t yet released in any version of SQL Server. needs to be included in the traced columns. If I have time, I’ll document what columns are required for the blocked process report event. Or I’ll improve error messaging (or both). Violation of PRIMARY KEY constraint ‘PK__#Reports__5E3C2CB26D0EC9A2’. Cannot insert duplicate key in object ‘dbo.#ReportsXML’. The duplicate key value is (unknown, 53, 0). Thanks for the great stored procedure. It has been helping our team to find out the blocking query. I am getting below error, when I try to open the trace file. Can you please modify the stored procedure to handle this scenario. Cannot insert the value NULL into column ‘blocking_ecid’, table ‘tempdb.dbo.#ReportsXML_________________________________________________________________________________________________________0000000000FD’; column does not allow nulls. INSERT fails. 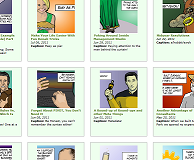 Hi there, the fastest way to get a fix is to mail me a trace file (mjswart@gmail.com). Alternatively, you can wait for me to debug this issue based on the error code but I don’t have an ETA on when that will get done. I have mailed the trace file for your debugging to your gmail address. Thanks for your quick response in this regard. God bless you for your services to the SQL Server community. I’ve updated the BPR Viewer with a new version that addresses the bugs listed in the previous comments. Go to the download page and download the new version. Thank you so much – this saved me a few days worth of analysis! So, what do you think to include Deadlock process inside the sp ? Hi Eric, you’re wondering about deadlock graphs and whether this tool can report them as well. I think that the blocked process report and the deadlock graph are very very similar, but there are some differences. The blocked process report viewer collects blocked process reports and groups them into “episodes”. The deadlock graph is already a collection of episodes. I was directed to your solution from a Brent Ozar blog post. (Locking and Blocking in SQL Server) This is great stuff, but I can’t seem to find a way to direct your stored procedure to an existing Extended Event file. It seems I can only open Profiler trace files. Am I doing something wrong, or is this a limitation of the procedure? It does work for Extended Event sessions that are currently running, but I have some existing.xel files I’d like to analyze with your procedure. Thanks for your great work and help! I don’t think I ever implemented a path to an XEL file. That would be a great addition to the script. But unfortunately, there is no way using the script as I’ve written it.